Even though we know our roofs are important, they are far too easy to ignore. Most of us don’t get a good look at our roofs on a regular basis, so we simply assume nothing is wrong—until there’s a big enough problem that we can’t ignore it. 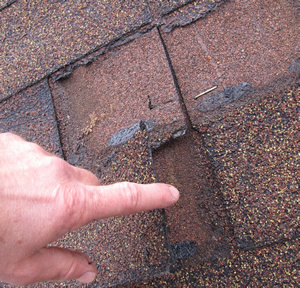 Shingles: Examine the shingles to see if any of them are missing, broken, buckling, or curling. If your shingles are doing anything except lying flat and straight on your roof, you might have shingle damage. Check the interior of your house for signs of leaks. Damp spots or dark spots on ceilings, walls, or along fireplaces are a sign that water is getting in somewhere. Also, peeling paint or wallpaper can be an indication of water damage. Moss or Lichen: Look for large areas covered by moss or lichen. Black algae stains are common, and mostly an aesthetic issue. However, moss is more damaging as it puts down roots into your roofs and holds in moisture. In addition, it can prevent a clear view of your roof which might hide roof damage during your inspection. If you see any of these, it may be a sign that your roof needs some repair. Also, while self-inspections are good, never underestimate the importance of professional inspections. Make sure you have a trusted roofer to call in case you ever have questions or concerns about your roof.